Jesus wouldn’t want anything to do with this, I guarantee it. The level of hypocrisy is breathtaking. Republicans say Al Franken needs to resign because he may have kissed women (adults) without permission and he was in an extremely inappropriate gag photo. 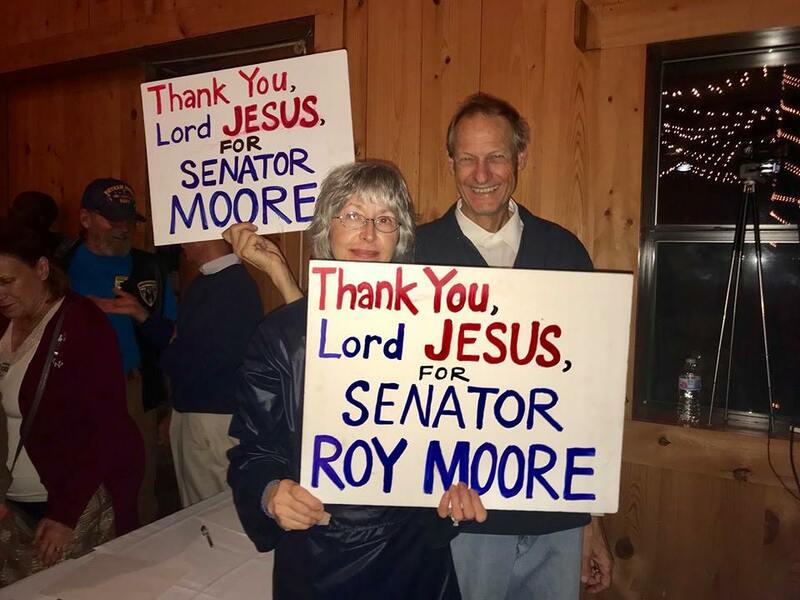 But they believe Jesus supports Roy Moore, who was banned from a shopping mall for stalking teenage girls when he was in his 30s and who has had nearly a dozen women come forward to report inappropriate sexual advances toward them when they were under age 18. Moore also was removed from his court bench twice for failing to follow court orders to remove Christian symbols from his courtroom. That’s not the Jesus I know. The Jesus I follow (not worship — he never wanted to be worshiped, he wanted to be followed) demands we care for the sick, feed the hungry, clothe the naked and give drink to the thirsty. He demands that we love our enemies. That’s the one I have trouble with when my enemies want to strip 68 million Americans — including 9 million children — of their access to health care, to keep millions of people in poverty while further enriching the 1 percent at the top of our deeply immoral economic system. For decades, the policy of the Republican party has been to take from the poor and middle class and give to the very wealthiest. They don’t care if people die, just as long as every pregnancy results in the live birth of a person they can neglect and kill later. The so-called tax “reform” bill is proof of that. The failure to reauthorize funding for CHIP and community care clinics and the sustained attacks on the Affordable Care Act prove that. It is more important to Republicans for these deeply unjust and immoral policies to be carried out than the saving of my life or yours. I walked through all three Senate office buildings in Washington yesterday, delivering letters begging for the re-authorization of CHIP and community care clinics and the shoring up of the Affordable Care Act. The letter had a photo of my late son and a reminder that when you strip access to care away from people, they die. Republicans care more about moving wealth up than they do about any human life, and then they call themselves “pro-life,” and Christian, when they are neither. As a party (and I won’t judge the intent of individuals here) Republicans are anti-life. They are pro-war, pro-death penalty, pro-gun and pro-corporations. They choose support for these things over support of human life every single time. And then they invoke Jesus. Well, when Jesus said to care for the sick, he didn’t mean to turn people who can’t pay away. He didn’t mean to attack systems that help people who aren’t wealthy so that tens of thousands die from medical neglect every year. When Jesus said to clothe the naked, he did not mean that we should keep minimum wage at about one-third of what it actually costs to live and then criticize people for not being able to buy coats and shoes for their children. When Jesus said to feed the hungry, he did not mean we should cut food stamps, Meals on Wheels and free and reduced-price meal programs in schools. When Jesus told us to visit people in prison, he did not mean we should turn over control of prisons to profiteers, who would starve prisoners to squeeze a little more money out of it. When Jesus said to give drink to the thirsty, he did not mean offer only water laced with lead to poor children in Flint, Michigan. When Jesus said to spread the Good News of redemption, he did not mean to discriminate against people who don’t have white skin or discriminate against people who don’t share your religious views. When Jesus said not to hate, he meant you should go ahead and make that wedding cake for the gay couple who want to celebrate the joining of their lives. When Jesus told us to love one another as he has loved us, that is precisely what he meant. He did not mean we should elect sexual predators to powerful positions because they are as mean-spirited and hate-filled as Republicans are today. He didn’t support unfettered access to guns. He didn’t support corporations as people. He did not support the economic terrorism of keeping people who can’t make bail or who can’t pay court costs for minor infractions of the law in jail for months or years. Jesus wants nothing to do with today’s Republican party, I guarantee you. Jesus is weeping for the poor in this nation. And he will judge the people who have harmed them. Get ready to sit with the goats on Judgment Day if you support the likes of Roy Moore or if you believe Jesus would. If you call yourself Christian and you don’t know what that means, read Matthew 25, starting at verse 31. If you really want to work toward a more just society, join the Poor People’s Campaign (www.poorpeoplescampaign.org).